Michael Hamlin-Smith grew up in North Ridgeville, a small suburb on the west side of Cleveland, Ohio. His affinity to work with his hands he tributes to his craft-oriented mother, Carole. Michael was inspired by the work he saw after participating in an exchange program with American Field Service in Paraguay. Soon after, Michael bought and installed a kiln in his friend’s basement and taught himself how to hand build, make glazes and fire his work. Later, Michael graduated with a Bachelor of Fine Arts degree from Columbus College of Art and Design in 1996. His current work is predominantly wheel thrown. His process starts by throwing the bottom half, allowing it to sit overnight to stiffen into a harder state, and throwing the following morning the top half onto the bottom. Next he trims the piece right side up and gently pushes the bottom in. 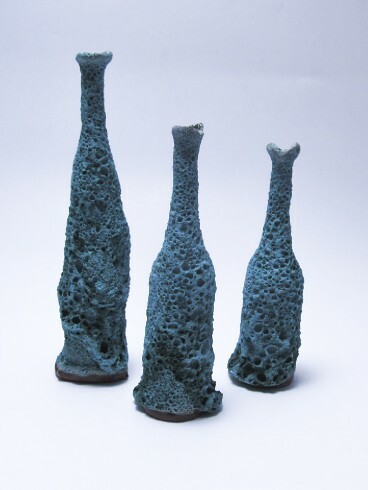 Michael’s work is influenced by midcentury modern, Scandinavian design as well as 12th-15th century Persian ceramics. He brushes on his glaze instead of dipping or pouring to create a matte surface that also offers visual texture. Emily Henderson - These vases are incredible. I love the unpredictability of these vases in the image above- the undulating form of the vase with this rough coralish texture is something that I personally do not see that often. Each vases has its own presence, yet they work so well together as a family. I am currently studying ceramics at Guilford College, and I coincidentally have to make a vase progression for my next assignment. Micheal's work is really exciting and is giving me a lot of inspiration. I will be sure to stop by Greenhill soon and check out upcoming art happenings!